Spadefoots differ from true toads, genus bufo, in that they have a nearly smooth, obviously moist skin and lack the distinct parotoid glands typical of toads. They are usually called "spadefoot toads" because of the digging tubercle on each hind foot and their squatty, toad-like shape. Spadefoots are brown or gray, usually with a few rust-colored dorsal nodules. They have a single black (not brown) wedge-shaped spade on each back foot. This device permits rapid digging in sandy or loess soils. Spadefoots also have vertically elliptical pupils (cat eyes) instead of the round pupils typical of most frogs, or the horizontally elliptical pupils characteristic of toads. One needs to examine the eye in fairly bright light to see this difference. Plains spade foots have a bump on the forehead between the eyes. The skin secretions of true toads are toxic to many animals that might eat them, but only a few (none from Iowa) are dangerous for humans to handle. However, spadefoots do have skin secretions that may produce severe allergic reactions, even initiation of asthma attacks in some people. 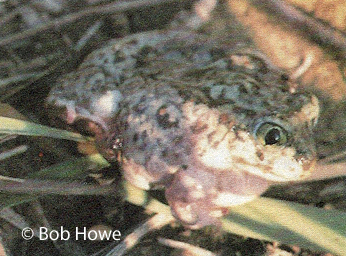 The toad-like, squatty shape of spadefoots easily distinguishes them from our frogs, and the pupil shape, lack of cranial ridges, and lack of distinct parotoid glands separate them from toads. Toads have two brown digging structures on each back foot rather than a single black spade. Our spadefoots range up to 2 1/8 inches (54 mm) in length. There are no recognized subspecies of S. bombifrons. Plains spade foots breed in Iowa in late May, June or July after heavy rains that fill their ephemeral breeding pools. The call is a loud, toneless quack, more like the call of Woodhouse's toad than any other Iowa species. Spadefoots live most of their lives underground, coming to the surface during heavy rains and periods of high humidity. They are highly adapted for survival in arid environments and their tadpoles are known to be cannibalistic, enabling them to concentrate protein and thyroxin for rapid growth and prompt metamorphosis in a rapidly drying pool. Scaphiopus bombifrons has a wide distribution on the Great Plains from southern Canada to northern Mexico. It was first discovered in the loess hills of western Iowa in 1959, leading us to suspect that it has only recently dispersed into the state. Thus far, it is limited to the western tier of counties where it breeds high in the hills, often in temporary roadside pools. The species is abundant in all these counties except the northern two. Encroaching forest may threaten their survival in some areas.